The development of social networking sites (SNNs) promotes for the emergence of social commerce. While social commerce has been widely accepted especially in the East, its simplicity and open interactions draw the attention of data and business protection needs. In addition, as more and more Muslims are participating in social commerce, it is imperative to evaluate how the practices comply with Islamic business rules. Therefore, based on the Muamalat principles, an insight is offered on how social commerce should be operated without violating the Islamic philosophies of business conducts via the Islamic marketing strategy, business ethics and sharia compliance business transactions. It is believed that by providing the discussion, it would safeguard both business and customers from any malpractices and business dishonesty that will jeopardize the Muslims’ image. Furthermore, this paper also provides recommendations and future research strategies. YAHYA, Yahyzat; KASSIM, Erne Suzila; OTHMAN, Abdul Kadir. 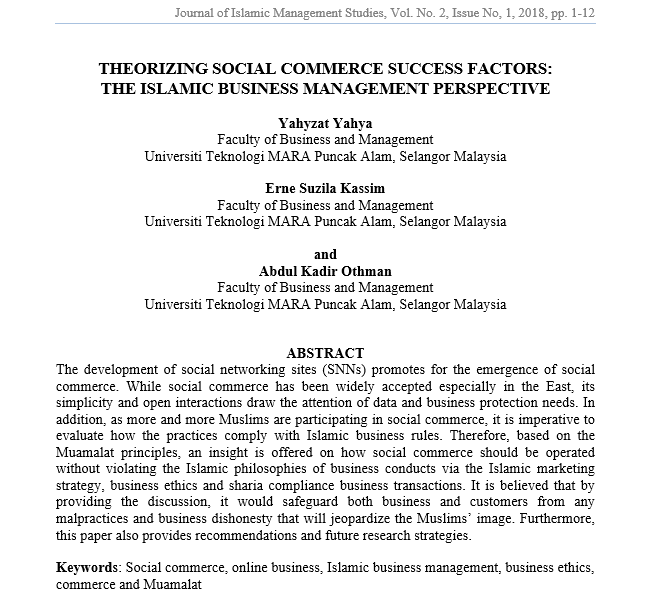 THEORIZING SOCIAL COMMERCE SUCCESS FACTORS: THE ISLAMIC BUSINESS MANAGEMENT PERSPECTIVE. Journal of Islamic Management Studies, [S.l. ], v. 2, n. 1, p. 1-12, mar. 2019. ISSN 2600-7126. Available at: <http://publications.waim.my/index.php/jims/article/view/106>. Date accessed: 24 apr. 2019.